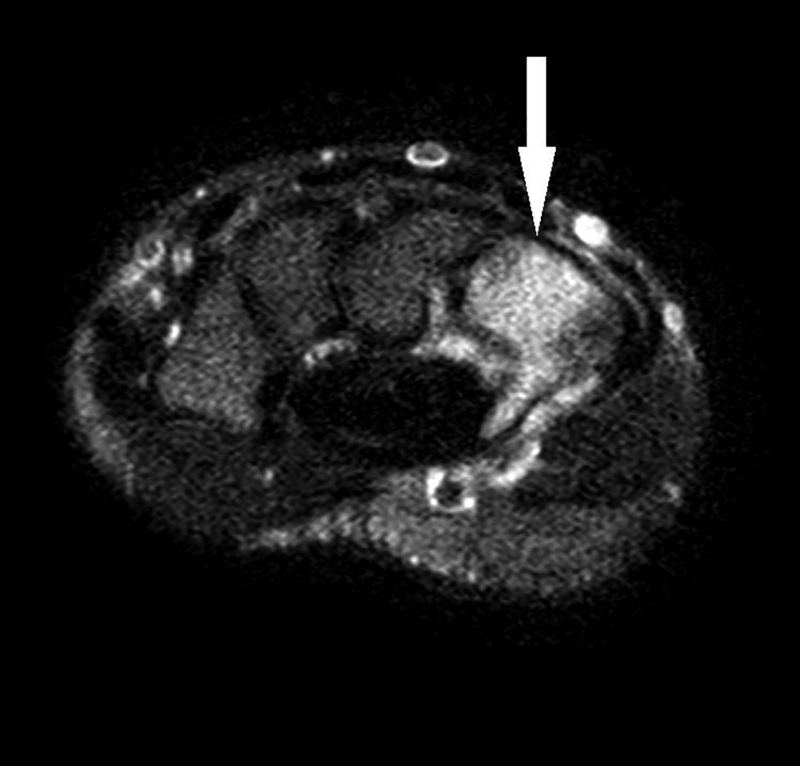 A 16-year-old boy presented with acute left wrist pain immediately after hitting a foul ball in a baseball game. The ball did not strike the patient’s wrist. Physical exam was notable for snuffbox tenderness and limited range of motion in all directions. Initial plain radiographs of the left wrist were performed at an outside facility (Figure 1). AP and lateral views were negative for fracture, periosteal changes, soft tissue swelling or joint effusion. Because there was high suspicion for injury, an MRI was obtained. 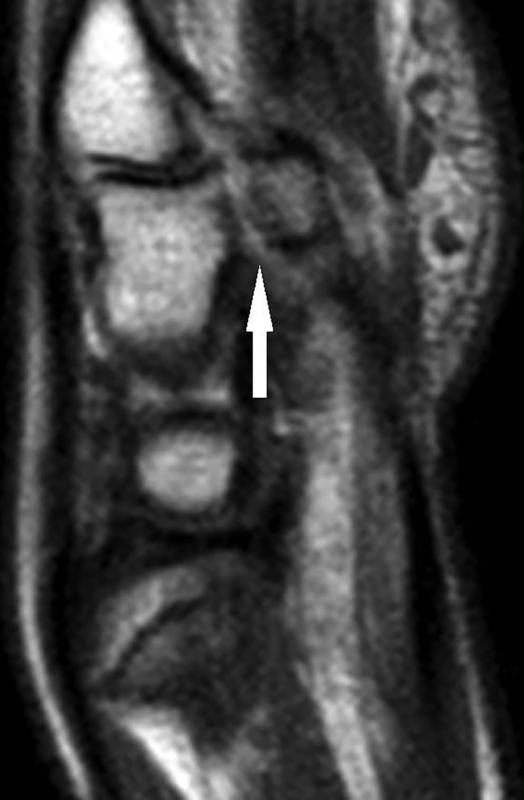 Axial T2-weighted images (Figure 2) demonstrate increased bone marrow signal within the hamate including the hook. Perihamate soft tissue edema is present. 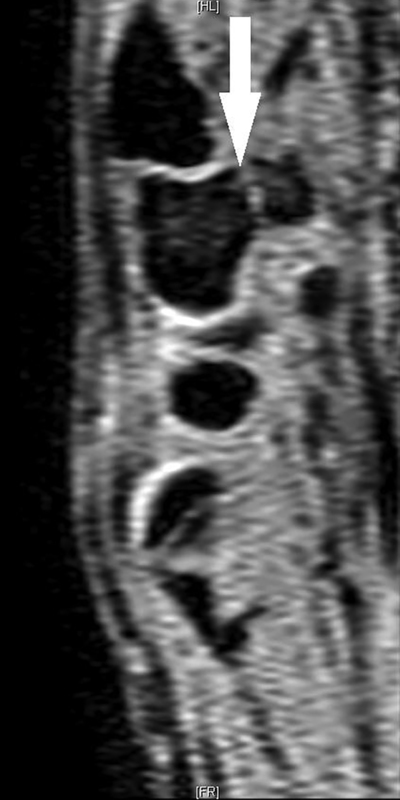 Coronal T1-weighted images (Figure 3) demonstrate decreased bone marrow signal within the hamate, including the hook. A sagittal T1 image (Figure 4) demonstrates abnormal linear signal through the base of the hook of the hamate consistent with a fracture. A sagittal WATS image (Figure 5) demonstrates abnormal linear signal through the base of the hook of the hamate consistent with a fracture. 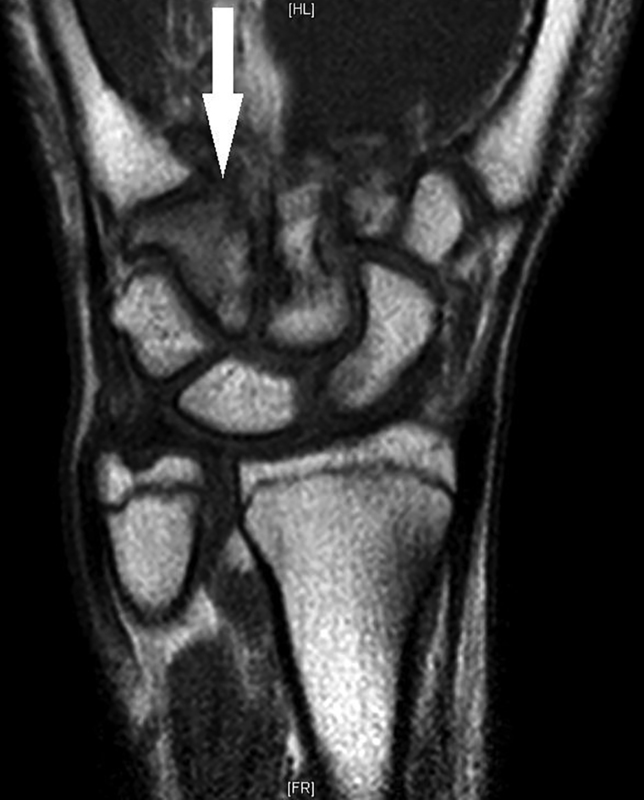 The scaphoid is normal on plain film and MRI. 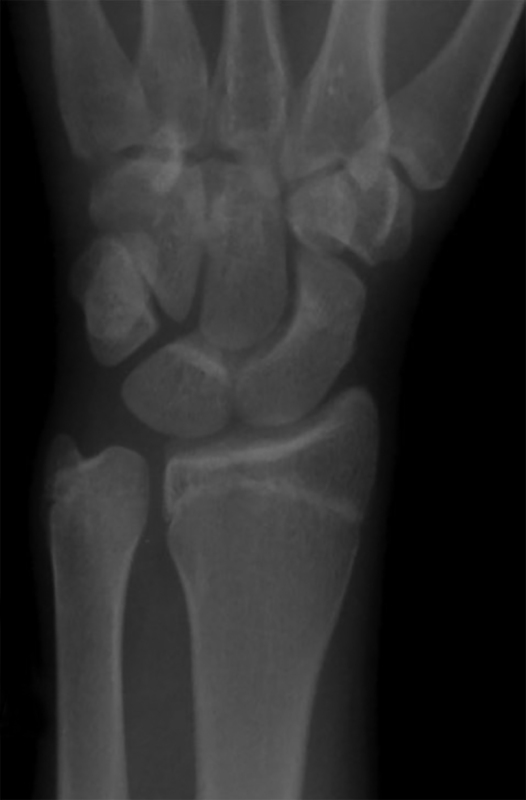 Non-displaced fracture of the hook of the hamate. The differential diagnosis includes scaphoid fracture (especially considering exam findings of snuffbox tenderness), other carpal bone fracture, ligamentous disruption without fracture, carpal bone dislocation. Radiographic evidence and thus diagnosis of hamate fractures is difficult to recognize on standard AP and lateral imaging. There are three specialized radiographic views to bring the hamate into better view: the carpal tunnel view; the supinated oblique view with the wrist dorsiflexed; and the lateral view projected through the first web space with the thumb abducted. Note that these positions, especially the carpal tunnel views, may be difficult to achieve in patients with pain from acute injury. 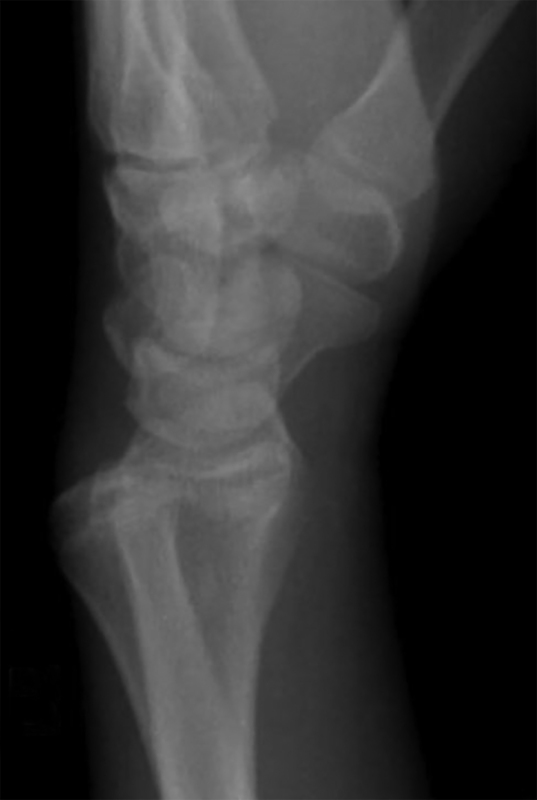 If plain films are negative or there is a high clinical suspicion of fracture, CT or MRI may be indicated to evaluate for an occult fracture.5 Studies have shown CT to have a sensitivity of 100%, specificity of 94%, and accuracy of 97.2% in defining hook fractures, whereas plain radiographs have a 72% sensitivity, 88% specificity, and 80.5% accuracy.6 MRI is also sensitive for hamate fractures and is useful in detecting concomitant soft tissue injury.7 However, at this time there are no published sensitivity, specificity and accuracy data. Although rare, hook of the hamate fractures should be considered in athletes who develop acute wrist pain after swinging a bat, racket, or club. Exam findings of hypothenar tenderness and difficulty grasping should raise the clinician’s suspicion. Furthermore, although there are several specialized views to help visualize the hamate bone radiographically, negative plain films do not rule out acute fracture. CT has been shown to have superior diagnostic capability. MRI may be useful in detecting concomitant soft tissue and tendinous injury. Botte M, Gelberman R. Fractures of the carpus, excluding scaphoid. Hand Clin.1987; 3:49-161. O’Shea K, Weiland A. Fractures of the hamate and pisiform bones. Hand Clin. 2012; 28:287-300. Binzer T, Carter P.Hook of the hamate fracture in athletes. Oper Tech Sports Med. 1996; 4:242. Green D, Wolfe S (2011) Green’s operative hand surgery, 6th edn. Elsevier/Churchill Livingstone, Philadelphia, PA.
Andresen R, Radmer S, Sparmann M et al. Imaging of hamate bone fractures in conventional x-rays and high-resolution computed tomography: An in vitro study. Invest Radiol.1999; 34:46-50. Murthy N, Ringler M.MR imaging of carpal fractures. Magn Reson Imaging Clin N Am. 2015; 23:405-416. Arthur J, Jorgensen SA, Towbin AJ, Towbin R. Hook of the hamate fracture. Appl Radiol. 2018;47(2):29-31. Prepared by Dr. Arthur while practicing at the University of Arizona College of Medicine-Phoenix, Phoenix, AZ; Dr. Jorgensen and Dr. Richard Towbin while practicing in the Diagnostic and Interventional Radiology Department of Phoenix Children’s Hospital, Phoenix, AZ; and Dr. Alexander Towbin, while practicing at Cincinnati Children’s Hospital, Cincinnati OH.